I’m not an artist. I know nothing about Art. It’s all a mystery to me. Sometimes I look at the work of “fine art photographers” and think, what’s up with this crap? With that disclaimer, here’s my take on an exhibition at a museum. 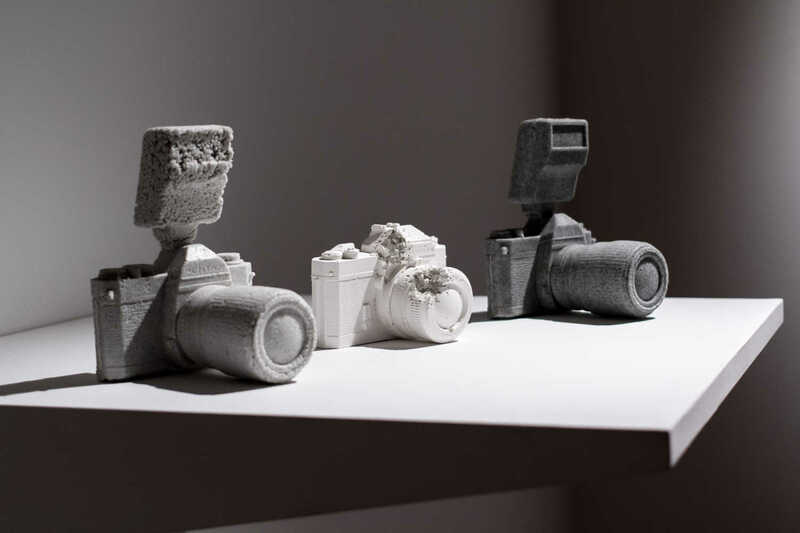 Camera sculptures as part of the exhibit. I only went to this museum because my old pal Pete Brook wrote a review, “Do We Love Cameras for Their Brains or Their Bodies?” in Wired. It’s about an art exhibit. 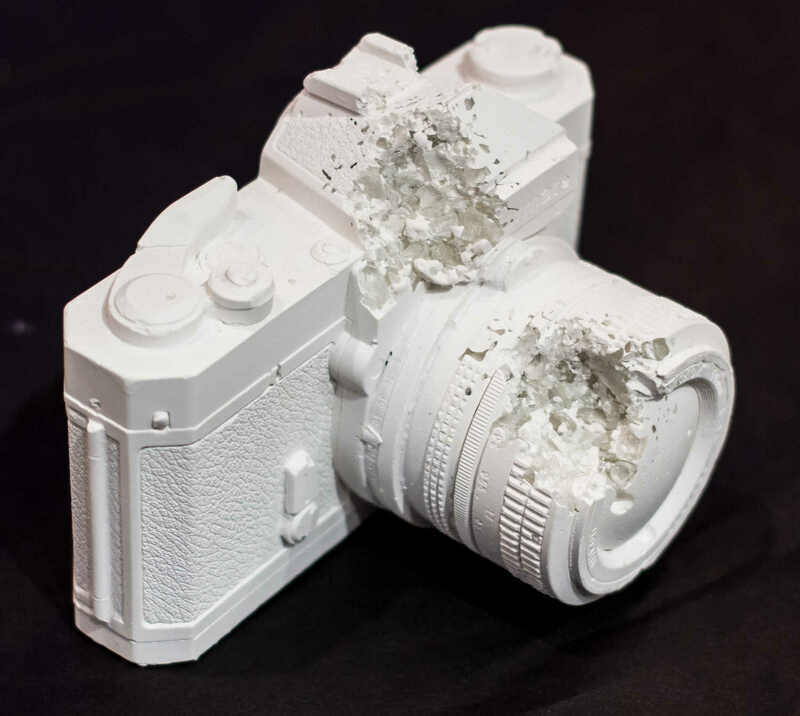 Disintegrating and crumbling camera sculptures, said Pete, make us question the form and function of cameras. 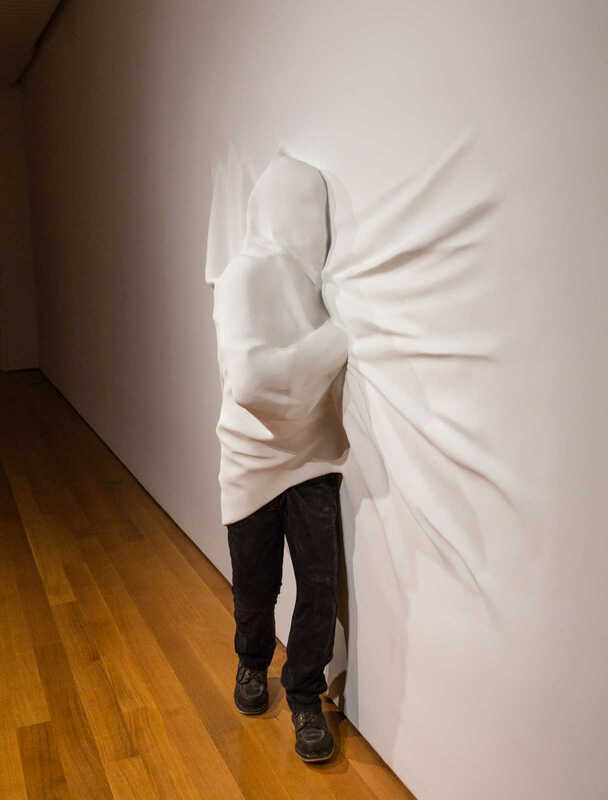 Pete quotes the artist who created this exhibit, Daniel Arsham: “Much of the time when we think about what a camera does, we think of it as a producer of images. The object itself is not always what is important. The camera is not the cultural artifact, the image is.” That was interesting enough to send me off to Philadelphia’s Fabric Workshop and Museum to see the exhibit. 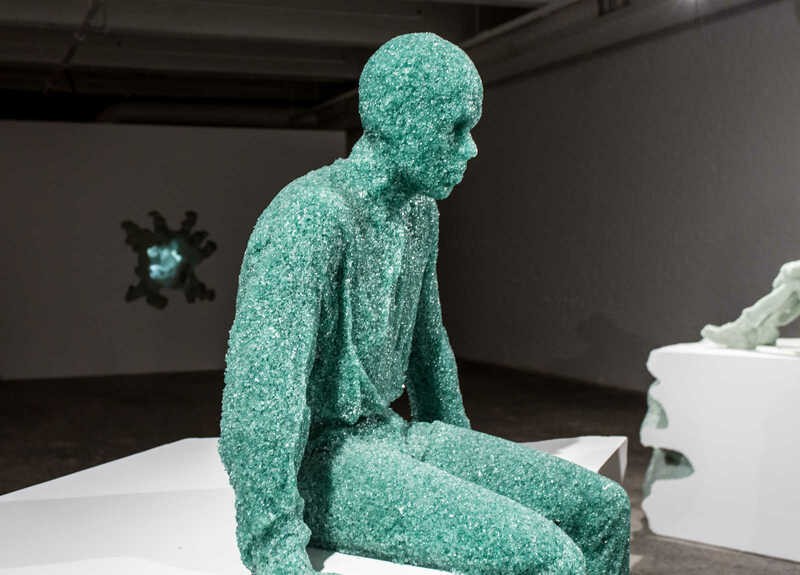 The human form is central to the exhibit. My experience of this Reach Ruin exhibition is that no person or thing remains unchanged against the forces of nature and the warp of time. What is not in a state of construction is necessarily in a state of destruction. Once matured, whether a person or a building or a camera, it pays a price for continued existence. The degree of change can be measured by forces of destruction and length of time acting upon the person or thing. Look at a high school yearbook picture, and you likely won’t recognize that person as a 60-year-old. But then, maybe this is nothing more than the concept of entropy. Does entropy operate only by degree? Who knows! On the other hand maybe we’re all just participating in this artist’s post-traumatic stress disorder. Another thought I had, given the Reach Ruin title, is the nautical term “reach.” It’s defined as “the direction or distance sailed by a vessel on one tack.” I can recall my sailing friends saying things like, “We were on a reach.” At the end of a reach, the sailing configuration has to be changed to avoid potential ruin. The “ruin” may be as simple as going off course and losing time, or it may be as calamitous as breaking up on the rocks. Again, I claim ignorance of the Art realm. I don’t know that much about sailing either. Struggling against, perhaps blinded by, the wind. The eye of the hurricane, I presume. 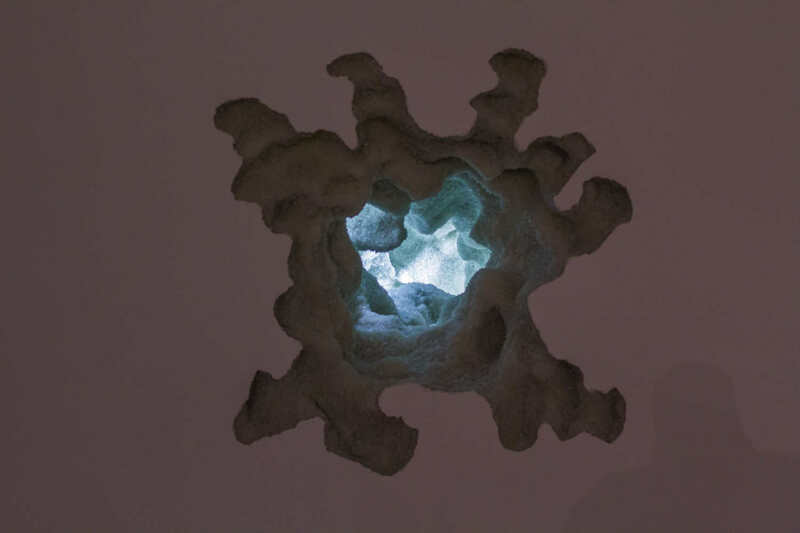 This is a hole in the wall with flashing lights inside and wind blowing out of it. Seemed a bit hokey to me. I’ve talked about this with an artist I know. He spent a lot of years as a graphic artist/designer and now does photography purely for his own gratification and enjoyment. The difference between us as photographers is that I take pictures while he creates art. Anyway, we have talked about the feelings we have about photographic equipment purely apart from its function. As much as I love a good picture, I appreciate cameras on one level for the great craftsmanship they contain/display. Aside from the aesthetics of pure form, they are wonderfully fine machines. A good SLR camera today is a tactile pleasure. With a finely designed camera, your fingers naturally fall into place to hold it correctly. Buttons and levers seem to be in just the right spots. The shutter button, for example feels like a silky pillow – the softest touch activates a function or series of functions (autofocus engagement of the lens, light metering, aperture or shutter speed setting). Sink your finger deeper into that silk pillow and the shutter activates (a mirror is raised and shutter curtains open to allow light to reach the film or digital sensor) and for most cameras this sound is of the finest machinery at work. It can be addictive, and many photographers may have a preference for one camera or another based on this shutter sound alone. Even changing a battery is a pleasure as the fresh battery slides in with the satisfying and solid fit of an ammunition magazine into a handgun. The human form again, with the eye of the storm at his back. The similarities of craftsmanship between good cameras and guns are hard not to notice. Even as I despise the lust for guns in our culture, I admire the perfection of the machines they are. In a good handgun, the trigger will operate as smoothly as a shutter button on a camera, some of them having the same type of two-step function. The slide of a semi-automatic is closely machined and it slides against the body, metal against metal like the skins of lovers upon one another. The heft and smoothness of a revolver’s ammunition chamber are a delight to the touch. The wind came in great blinding sheets, I suppose. I just enjoyed looking at this. The gun and camera enthusiast groups differ only in subject matter. Drop into any Internet forum and people will be feverishly arguing technical aspects, techniques, equipment suitability, new products, law (government interference of one sort or another). Subjects for the gun crowd might be muzzle velocity, barrel configurations, trigger pull, sight types, full metal jacket versus hollow point bullets, hot loads. The photographer crowd meanwhile will be discussing pixel densities, graduated neutral density filters, lens vignetting, modulation transfer function charts, tone curves and on and on. All these discussions proceed from, and I suppose also, transcend the objects being discussed. Maybe it simply means this is why some people collect guns and some people collect cameras. Fondling them and talking about them may be more satisfying than actually using them. While talking about this exhibit one man asked me if he should go see it. “Is it worth seeing, or is it lame?” he asked. All I could say is that it was interesting and thought provoking to me. I’d refer him to an artist to say if it’s “lame” or not. 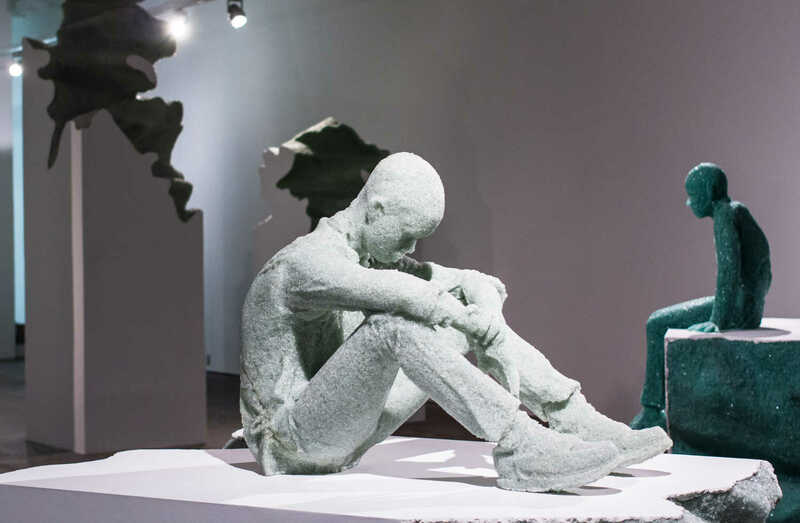 The show runs through mid-March 2013 at Philadelphia’s Fabric Workshop and Museum. All images accompanying this piece were created using cameras. The museum has some of these camera sculptures for sale. I believe around $100 each. Contact the museum for details. As always interesting and thought provoking.. Thank you Bill………. This article is provocative. To me, just my old-fashioned opinion, concept art is at best interesting and really not something I want to look at more than once. With concept art, once you get the idea, that is pretty much it. Good art is eternal because it is meaningful, timeless, has many layers and is pleasing or intriguing in form. Even I can enjoy the man caught in the sheets, though. 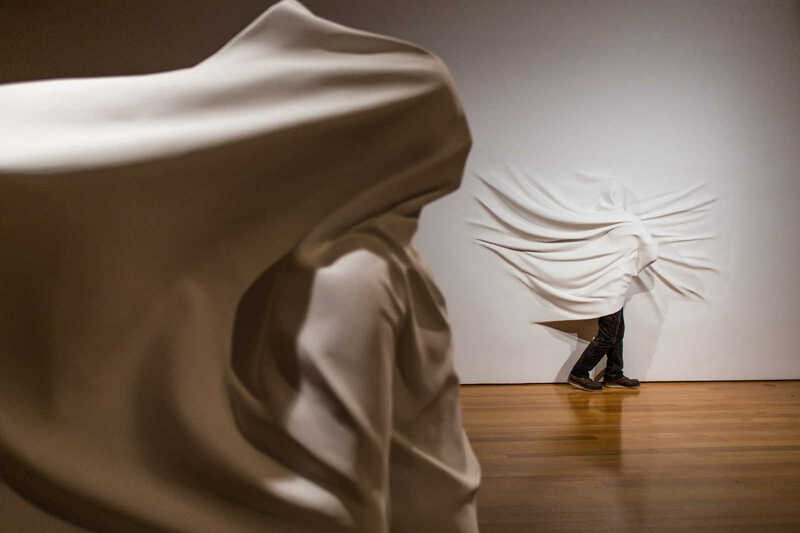 That is a physical representation of a feeling that is very evocative and has many layers (or sheets!) of meaning.